The 2017 Hyundai Santa-Fe Sport is a compact SUV that delivers an athletic ride, refined cabin, and impressive safety features. Inside, premium features are designed to help you make the most of your daily commute. There's always plenty of space for passengers and cargo alike. On the road, the Santa-Fe Sport isn't merely comfortable and refined - it makes the most of what you spend at the pump. Modern safety gear keeps you protected on the go. Inside, the 2017 Hyundai Santa-Fe Sport is stylish and comfortable. Two rows of seating provide plenty of room for the entire family. From behind the wheel, you'll love the Santa-Fe Sport's commanding view of the road and impressive lumbar support. When you travel with four of your closest, adult-sized friends, you'll find everyone has more than enough head- and legroom. The cabin's panoramic sunroof lets in plenty of sunlight, and it even slides open for an extra dose of fresh air. Behind the rear seats, you'll find a profusion of cargo space for your weekend bags and golf clubs. This compact SUV is equally big on tech features. The navigation system gives you turn-by-turn directions and, impressively, treats you to real-time traffic information and alternative routes. It will even guide you to the nearest gas station if need be. The rearview camera makes backing up a snap, giving you a clear view of any obstacles in your path. For even greater visibility, check out the multi-view camera system, which provides a bird's eye view of your Santa-Fe Sport and helps you ease into parallel parking spaces. The 2017 Hyundai Santa-Fe Sport offers world-class safety. The automatic emergency braking system applies the brakes when it detects an imminent collision. It detects more than the vehicles in your path - it also senses pedestrians. The blind spot detection system alerts you when a vehicle pulls into the driver's side blind spot, displaying an icon on your mirror and issuing an audible warning. 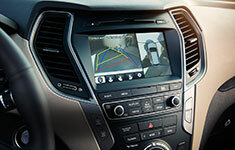 Rear parking sensors enhance the rearview camera system to make backing up even simpler. Under the hood, the Santa-Fe Sport balances generous engine output with modern fuel economy. The 2.4-liter four-cylinder engine generates 185 horses and 178 pound-feet of torque for a swift, refined performance. If you crave additional power, the Santa-Fe Sport is ready for action. Choose the 2.0-liter GDI four-cylinder engine to boost output to 265 horses and 269 pound-feet of torque. The Santa-Fe Sport is also big on towing capabilities, making it a great pick for drivers with hauling needs. Properly equipped, the Santa-Fe Sport can tow up to 3,500 pounds. On the road, the Santa-Fe Sport delivers smooth sailing. Even with your boat or camper in tow, you'll find this SUV accelerates with ease. The suspension is tuned for a comfortable ride, which feels great during lengthy road trips. Sharp steering and responsive handling make the Santa-Fe Sport a great choice for city grids and winding country roads alike. For premium performance and interior comfort, choose the Sport 2.0T Ultimate model. It comes standard with the 2.0-liter four-cylinder engine for 265 horses and 269 pound-feet of torque, maximizing your on-road experience. Inside, high-tech gear offers features like hands-free calling and turn-by-turn navigation. Cabin details, including the leather steering wheel and dual zone climate controls, set a luxurious tone. 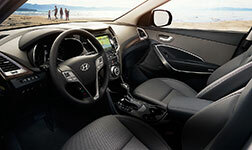 The Santa-Fe Sport puts a premium on interior space. Check your surroundings to optimize safety. With the turbocharged engine and Drive Mode Select, you'll cruise around in style. 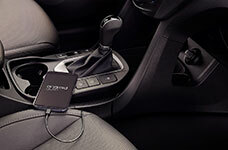 Smartphone integration enhances your infotainment options. The 2017 Hyundai Santa-Fe Sport is a best-in-class compact SUV, giving you excellent passenger space and proficient power. You'll coast through any environment and tow max loads with ease. 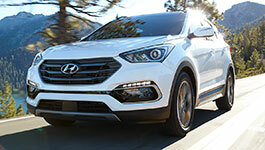 Inside, the Santa-Fe Sport is high-tech and luxurious. Advanced safety systems enhance driver vigilance and on-road passenger protection. Come in and test drive the Santa-Fe today!